The short message system (SMS) of a standard mobile phone can be used for remote site monitoring and controlling various equipments. The SMS service provided by the service providers is comparatively very low cost. The Short Message Service allows text messages to be sent and received to and from mobile telephones. This feature of a standard mobile phone can be implemented for a variety of industrial applications. The main attractive feature of this system is that the user can monitor and control his desired equipments from any part of the world. It works on the basis of Global System for Mobile Communication (GSM). The user may get the status of a remote device like pressure, temperature, voltage, current, On/Off condition, weight etc by sending respective SMS to the remote device. The remote device also automatically sends a SMS to the user if any error/alarm occurs during its operation, which is previously defined by the user. The user then may take the necessary action depending on the type of alarm through respective SMS or by any other way. GSM mobile phone (SMS) based automobile security system. GPS and SMS based tracking system. SMS based Motor monitoring and control system(Speed as well as On/Off). SMS based Air conditioner monitoring and control system. SMS based Valve monitoring and control system. SMS based Temperature monitoring and control system. 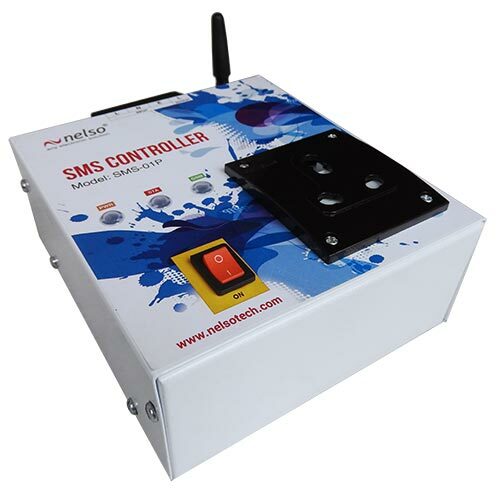 SMS based Liquid level monitoring and control system. SMS based Current/Voltage monitoring and control system etc.